Before we explain our postcard today, we must tell you a bit about Rock Island’s Hotel Harms. In the near future we will give the hotel that opened in 1902 and once stood on the southwest corner of 18th Street and First Avenue a column all its own. The hotel was named for its German-born owner Lothar Harms, who had first come to Rock Island in 1866 as a young married man. Photos of the Hotel Harms show an elegant five-story building, with arched openings on its first floor. The main entrance to the lobby was centered on the 18th Street facade. Both the tap room and an adjoining restaurant on the north side of the building could be accessed from the lobby as well as by other direct exterior doorways. Lothar Harms died in 1927. In 1931, Frank P. Welch acquired the hotel through foreclosure proceedings. A few years later, it became the property of Francis J. Coyle, local attorney who later became both a judge and a state representative. He owned the hotel until it burned in 1974. We are grateful to Mr. Coyle’s son, attorney Francis J. (Frank) Coyle, Jr. for providing much of the information for our tale today. The tap room’s walls and ceilings – as well those elsewhere in the hotel’s public areas – were reported to be frescoed and embellished with hand painted scenes by Moline artist Frank Lundahl. Among the artworks were “hunting scenes, trophies of the chase, and cupids in various poses.” Alas, these were painted over during Mr. Welch’s brief ownership. When we first examined the postcard, it was easy to imagine that the picture was made right after the hotel was opened. But then we noticed the chromed Art Deco bar stools that confirm a 1935 date written on the back of the postcard. Mr. Coyle agreed with that date and recognized his uncle, Owen Coyle, the bow-tied bartender on the left. 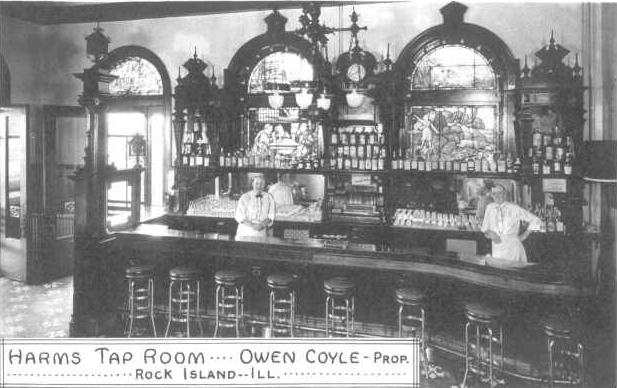 Owen Coyle “reigned supreme” over the Harms Tap Room and the adjoining restaurant until his death in 1947. The magnificent back bar is not typical of turn-of-the-century furniture, but rather evokes the walnut Renaissance revival furniture of the 1860s. It beautifully frames the imported stained glass windows that carry out the hunting and harvest themes. We can partly recognize the window designs on the postcard, but Mr. Coyle filled in the details. The rectangular window at the left shows tonsured monks seated around a table quaffing hearty mugs, surely of German beer. The half round “demilune” window above it depicts another table, filled with fruits of the harvest and hunt. The other rectangular window shows Diana, Roman goddess of the hunt, about to throw a spear at a fleeing stag. In the demilune above it, a hunting dog searches for game. Electric light bulbs line the window frames, ensuring they would be highly visible from the outside. The tap room was located in the northeast corner of the hotel. The arched opening at the far left of our photo led to the restaurant, while the other doorway led directly to the street. This door was closed in later years. After Owen’s death, the bar and restaurant were briefly operated under the name “Bogaert’s Harms Buffet.” In the early 1950s, Alfred “Al” Klass brought the memorable “Gay Nineties” restaurant to this space. Surprisingly, the lower two stories were nearly intact. So intact, that the Coyles explored options to remove the upper floors and keep the two lower stories, thus preserving the most ornate details within the public areas of the hotel. Moreover they had recovered the purloined windows, which could be reinstalled. But in the mid 1970s there was little local sentiment for preservation of historic buildings (the Harper House Hotel had recently been demolished), and the future of downtown looked bleak as well. A little over a year after the fire, the Hotel Harms fell to the wrecking ball. This article, by Diane Oestreich, is slightly modified from the original which appeared in the Rock Island Argus and Moline Dispatch on January 12, 2003.